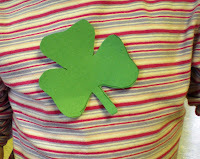 Preschool Playbook: Happy St. Patrick's Day! Well I made it. I got through the day, and I'm still coherent. We did so much today, but it was really fun! This post may get a bit long as there was quite a bit to today. We began our day talking about St. Patrick, that he was from Ireland, he scared the snakes from Ireland, the Irish people loved him for all he did for them. 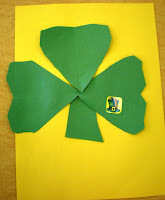 We talked about green shamrocks, rainbows with gold at the end which is protected by leprechauns, and even danced an Irish jig. After opening our first course of action was to play a find the shamrock game. 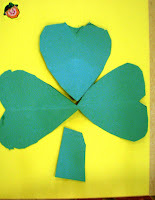 I had cut out enough shamrocks for each child to have one. During opening time Mrs. T "hid" them in the room. The children each got to find one and they wore it the rest of the day. 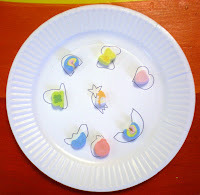 I had Lucky Charm sorting on one table. 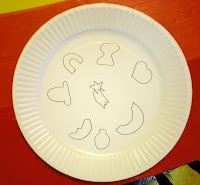 I had taken 4 small paper plates and drew the marshmallow shapes on them. 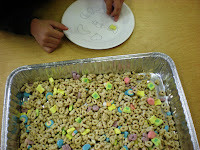 The children looked for the cereal to match the marshmallow shapes, then they got to eat them. There were a few I had to limit their "finding" time. I think they were going to eat the whole container. This craft was a bit involved. 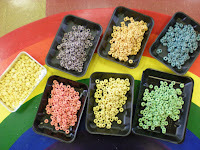 The first part came at home where we separated the Fruit Loops into containers according to their colors. 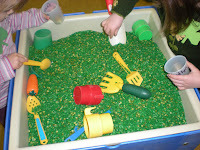 I thought about letting the children go through a mixed container, but I figured it might take too long. It took a while even the way we did it. 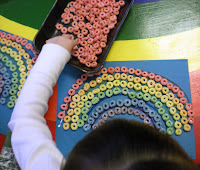 Next, I put the Fruit Loops and a container of Corn Pops in a row along the craft table. This may sound odd, but we did the craft in "assembly line" fashion. 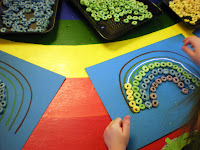 When I began the craft I drew a rainbow with markers, put on the first line of glue--that tacky can get hard to squeeze--then started the children at the purple "loop" container, when that color was done they moved on to blue, then green, etc., until they went through all the colors and got to the gold. 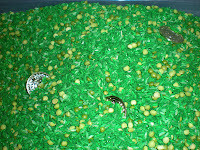 When they reached the Corn Pops we put on a big glob a tacky and they made a pile of gold. 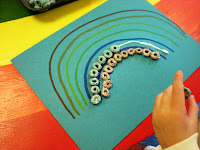 As the time moved on, I realized I didn't really have to draw the rainbow as the children were already in front of the color they needed, so I just put the glue on. I put on the glue, one color at a time: purple, when done glue for blue, when done glue for green, etc. As one child finished the first container I brought in the next child. It worked pretty well, but we were still over time. 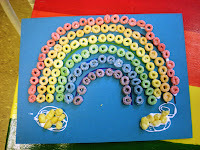 The rainbows turned out really great and smelled even better. I have to say I was also completely impressed how all the children finished the craft from the beginning to the end. Sometimes, with longer crafts the children get tired and don't want to finish. I didn't hear that once today. For snack we had green applesauce. 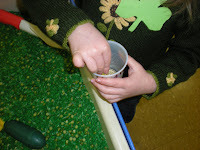 I gave each child a cup with applesauce in it. 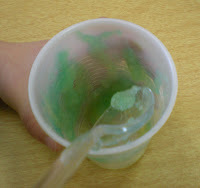 They added a drop of green food coloring and stirred. The loved this. Skill time consisted of cutting practice. I can't express enough how WONDERFUL these children have gotten at cutting. 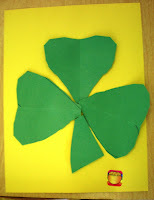 I gave each child three folded pieces of green paper with half a heart drawn on it. They cut out these three hearts. 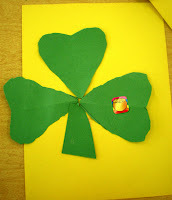 We then glued them down in shamrock form and added a stem. Yes they cut these, and they glued them down. I did have a sample and gave some verbal instructions about having the points all touch, but I think they did great. 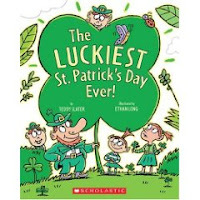 We ended the day by reading a cute story called, "The Luckiest St. Patrick's Day Ever!," by Teddy Slater, illustrated by Ethan Long. 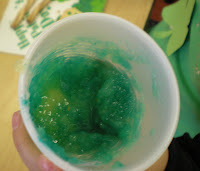 It's a cute rhyming story with the leprechauns, their parade, and their feast. I have trouble finding a good story that doesn't have too much text. This one was pretty good. I'm tired just looking at all your fun projects. But they look like such fun! I loved that you took the time to post it for everyone ,thanks a bunch! I have a question/comment, i love the "skill time" feature in your schedule. Are you a full day class room or half day? 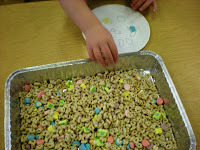 I am having some trouble incorporating "little" centers in my day like "skill time"
I love the cereal rainbows! Wow, you had a lot happening! But it looks so wonderful! 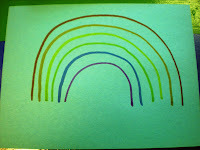 We followed a rainbow trail that led us upstairs to find a room full of coins to hunt. I do this every year. 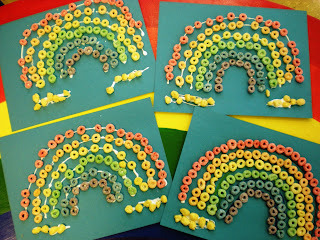 The cereal rainbows are so cute! What a fun day!! At first I thought I was looking at a St. Patrick's theme-party. Thanks for sharing all the ideas. You have the best ideas! Thanks for sharing! That looks like a cute book! Haven't read that one yet. LOVE the rainbows! What a busy day you had - I bet the kids loved it, though!